Lost Atlases: Step Three: the first attempt at putting the map on a grid. Step Three: the first attempt at putting the map on a grid. So this post will be about my first attempt to put this small village onto a grid. For the record, this was a rushed map - hastily sketched out to see how the arrangement of features would look and whether it was an overall good use of space. 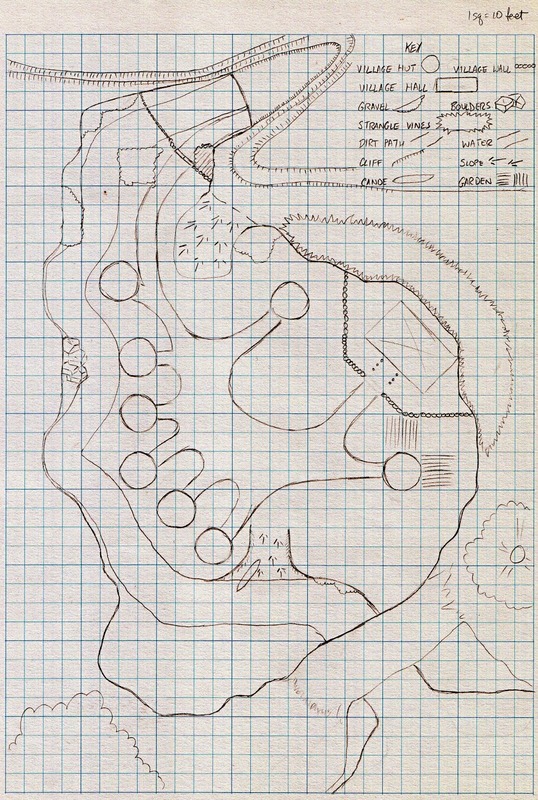 Remember, I was considering using this map as an entry to the RPG Superstar competition. So the map had to be more than just "serviceable". It had to kick posterior. First attempt at placing the map on a grid. Note the scale is different than the usual 1 square = 5 feet. Ok. So, what is important about this map? Well, I tried out a few things and you can see that there are some other ideas that are germinating in my mind. First, I've increased the size of the village. There are now twice as many huts, although the basic arrangement remains the same. I have also added additional elevation to the top of the map. The combination of additional dwellings and a better defensive position is an indication that this is moving from just a small outpost to a more important settlement. It is interesting that there is also a boat lying on the boat-ramp. This small change is the only observable change in a fundamental shifting of my thought processes. Prior to this, I had assumed the stream was no more than a foot or two deep. Now, it is deep enough for at least fifteen foot canoe at the downstream end. Shortly after deciding upon this change in my head I also read that lizardfolk are quite accomplished swimmers and would probably not need boats. Therefore the logical conclusion was that this boat was for visitors. Ah! But what would be here that would attract visitors. It did not take long for me to decide that a temple devoted to ancestor spirits would be appropriate. Turning this into a temple was probably the largest change I made while designing this map. A temple is very appropriate to this setting. Temples are frequently located in unusual or highly defensible places. A temple would be a reason for adventurers to visit and helping out the caretakers could provide both an adventure hook as well as a base of operations. Its a good, solid idea. But after sketching this out I decided it wasn't 'Superstar' material. It had the one hook - the arch, but that's it. The village could have been lifted out of anywhere and I felt that I was missing something with not fleshing out the cave. Its what I felt were these shortcomings that made me want to take another crack at this map.